Posture is the ability of man to keep your body in different positions, the usual posture relaxed standing person. With proper posture, body straight, shoulders back, stomach tucked up, head up, eyes looking forward. In any job, any sport, you need to be able to keep your body. Correct posture, coupled with coordinated, coherent and deft movements, makes you strong and beautiful. What can be better ballet? Not looking up you can admire the artistic gymnastics and figure skating. But this beauty is created by not only skilled movements of the performers, but also their ability to keep your body. And in heavy types of work the ability to keep your body helps man to be strong. As the free movement of blast furnace and a woodcutter, the weavers and Turner! And how many lines of verse in Russian literature devoted to the reapers! People who cannot keep his body, stand, walk on bent legs, hunched over his head and shoulders, with his stomach. But the strange thing is, some young people believe that is the posture and rachmaninow beautiful gait. And it's not only ugly, but harmful. Bad posture is hampered the activities of all internal organs and first of all lung and heart function, reduced respiratory movements, reduced lung capacity. This means that the decreased oxygen delivery to the tissues and organs. How is formed posture? Is it possible to prevent the formation of bad posture and how to do it? On the character of the posture of a man greatly influenced by the spine, as it is the main bone rod and link all parts of the skeleton. The spine provides vertical position of a body, keeps it in balance, supports the weight of the head and upper body. He is a rod, consisting of individual vertebrae (Fig. 1). This provides him with great mobility. Most mobile in the cervical spine and lumbar departments; standing still, you can easily turn your head and torso in one direction or another. Thoracic mobility of the spine is very small. Fig. 1. 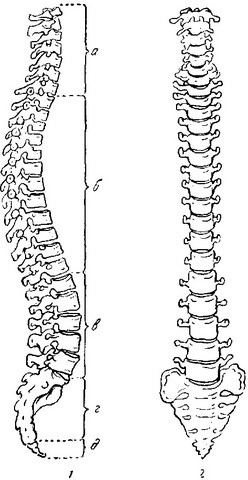 The human spine. The spine has four bending, two of which are convex to forward (cervical and lumbar) and two bulge back (thoracic and sacral). They appear in early childhood in connection with occurrence of the child has the ability to hold his head, and then to sit and stand. Finally spine curves formed to 6-7 years, and fixed - to 18-20 years. In early childhood spine consists mainly of cartilage gradually smenauscheesa bone tissue. The upper and lower surface of the vertebral bodies to ossify 15-16 years, ends ossification at a later age (after 20 years). Boys over the age of 13, the spine is rapidly growing in length, girls growth of the spine slower. At this age, boys outperform girls in growth. In the vertical position, the spine is held with the help of the muscles that surround it (back muscles, abdominals, and others). The strongest muscle, extensor and straightening the spine, is a long muscles of the back, which stretches all along the spine from the bones of the skull to the sacrum. These muscles form a natural "muscular". It holds the spine in an upright position and ensures a correct posture. Therefore, the development of muscles plays a major role in the correct posture. The major role is played not by the power of the muscles, and even development and their proper distribution of muscle pull on the spine. By nature the structure of the human body mainly symmetrically. Therefore, the muscles of the left and right halves of the body must be developed equally. If muscles are developed evenly and pull flexor balanced thrust extensors of the body and head are in direct, beautiful position. It is interesting to note that often the people engaged in hard physical labor, porters, hammers, and in athletes-athletes - weightlifters, wrestlers, and so on - the poor posture due to the excessive development of certain muscle groups. Conversely, the athletes involved in this type of sport that promote balanced development of all muscular groups (gymnasts, athletes), there is a good posture. So, the most frequent cause of violations of carriage is or weakness of the muscles of the body, or the irregularity of their development. And the children of school age into force age peculiarities muscles are developed enough yet, they have no strong natural "muscular". Under adverse conditions, which will be discussed below, it becomes the cause incorrect posture. Besides at school age the development of the skeleton has not been completed, the spine flexible and pliable. Originally arising posture can go to the curvature of the spine. Incorrect posture and spinal curvature quite common among students. The greatest number of violations of carriage, accompanied by changes in the spine, is observed at the age of 11-15 years, i.e. during the period of intensive growth. During medical examinations in schools comes from 20 to 40% of students with defects posture. This is a very high percentage. And this is a violation can be prevented if you are actively helps the doctor and teacher.